Background: In the dawning era of precision medicine, increasingly sophisticated tools are becoming available to diagnose and investigate rare and unexplained diseases. The application of these tools to clinical practice will require new models of collaboration between clinicians, tool developers, and laboratory investigators. Many structural barriers to such collaboration exist in our current healthcare delivery system, including time and cost constraints and the siloing of both clinical and scientific experts. These dynamics have created the need for new approaches to bridge the clinical/basic research divide. Purpose: To develop and pilot a Molecular Medicine Consult Service (MMCS) to engage the basic science community as a resource for educational and diagnostic consultation in the care of hospitalized patients with complex illnesses. Description: This program is based in an 800-bed hospital affiliated with a large medical school and a robust basic science community. A group of key stakeholders, including residency leadership, directors of our physician-scientist training programs, and directors of research for our hospitalist division and department of medicine, championed the creation of the MMCS. The pilot program was funded by philanthropic donations with matching funds from the department of medicine. The MMCS consists of an Integration Team (IT) and a Scientific Advisory Panel (SAP). The IT includes a hospitalist or subspecialist with Ph.D. training in basic research working with trainees from our physician-scientist training programs. This team accepts referrals of patients with rare or unusual symptoms who lack a satisfying diagnosis despite thorough medical evaluation. The SAP includes physician-scientist representatives from each medical specialty and directs the IT to scientific consultants who have relevant expertise in either the potential mechanisms of disease and/or experimental tools that may shed light on the underlying pathophysiology. For each case, the IT consults with clinical and scientific experts, conducts a literature review, helps to coordinate and plan research studies, synthesizes this information and any research findings for the primary team, and disseminates teaching from these cases in multidisciplinary case conferences. The MMCS pilot was launched in July 2017 on the inpatient medicine service. As of December 1, 2017, the MMCS had evaluated 35 consults and presented findings at 4 multidisciplinary case conferences. 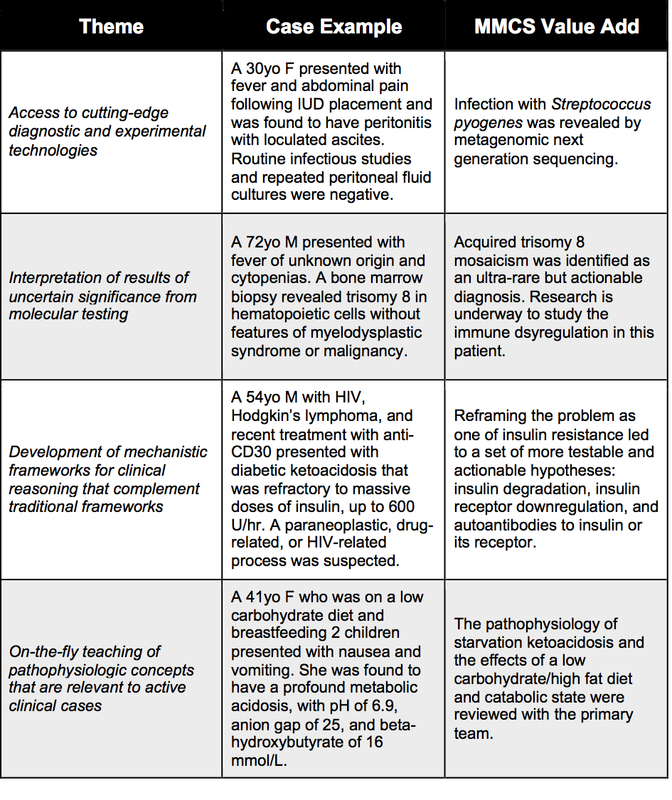 Table 1 presents several examples of how the MMCS has been applied. Conclusions: By integrating biomedical science into routine clinical care, a basic science consult service like the MMCS can leverage an academic medical center’s research enterprise to improve clinical care and training. Determining whether such a service improves healthcare outcomes will be an important topic for future research. Berger, AC; Matloubian, M; Anderson, M; Shah, NP; Weiss, A; Klein, O; Chiu, C; Harleman, E; Fang, MC; Wachter, RM; DeRisi, J. ADDING SCIENTIFIC CONSULTANTS TO OUR ARMAMENTARIUM: A BASIC SCIENCE CONSULT SERVICE. Abstract published at Hospital Medicine 2018; April 8-11; Orlando, Fla. Abstract Top 15 Research & Innovations. https://www.shmabstracts.com/abstract/adding-scientific-consultants-to-our-armamentarium-a-basic-science-consult-service/. Accessed April 22, 2019.